An overnight Amtrak out of Chicago was the first leg of a 24-hour journey to reach upstate New York for a week in a Catskills hotel, courtesy of Mum! 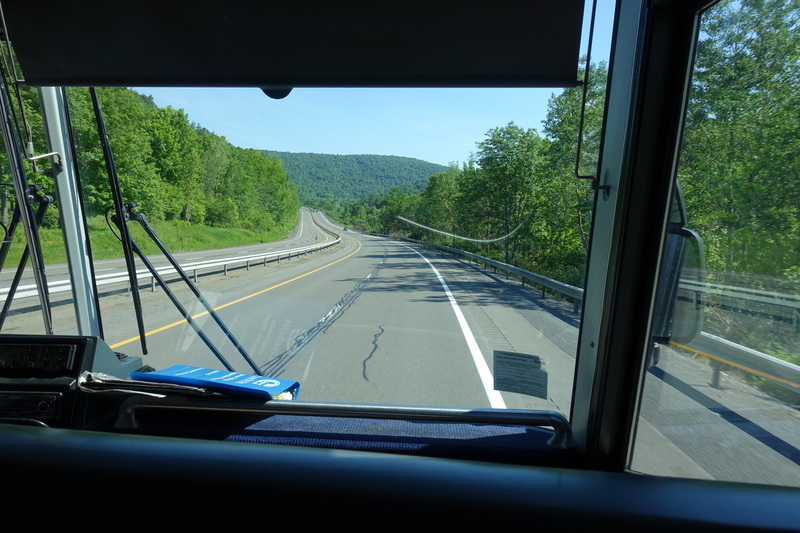 It ran so late we nearly missed our connecting bus from Syracuse to Binghamton but we dashed on to the Greyhound as it rumbled into life in time to discover afresh how lovely Americans can be. 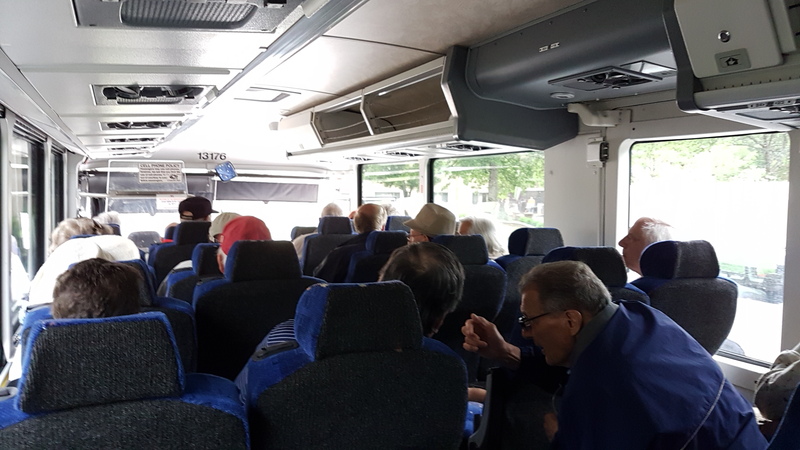 The bus was packed by the time we piled on but “JD” noticed the whites of our eyes rolling in panic deduced we were together and moved seats so we could sit beside each other. As our heartbeats slowed he told us he was a professional tour guide. He then dispensed a pile of professional advice on our route and transport selections before going to sleep, whereupon we gaped out at the increasingly dramatic mountains. On the next bus, from Binghamton to Monticello, driver Brad regaled us with tales of his beautiful and entrepreneurial Brazilian second wife, who is setting up a lucrative food business from their backyard to his general bemusement, and with facts about the surrounding, impossibly green maple forests, and the Delaware River glittering far below the windows. We saw hours and hours of this. 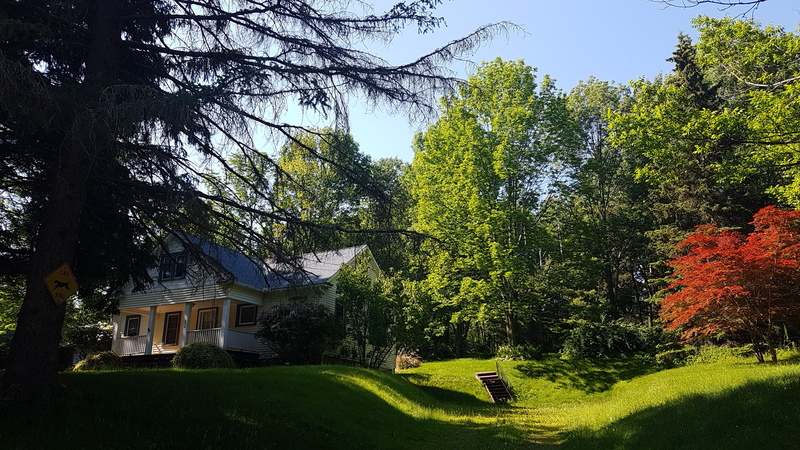 The Catskills, he said, were in their heyday akin to The Hamptons, a holiday destination for the rich and famous, including the Rockefellers. Now, we have found, they are targeted by the Italians and blue-rinses who choose Villa Roma for its odd cruise-ship-on-land feel and Roman theme, complete with Caesar night in which the Director dresses up and rides a chariot around. Yep. On the final bus from Monticello to the resort, which we staggered on to exhausted and smelly, driver Eric regaled us with stories of his two little boys who he teaches to ward off bullies, to greet and farewell every house guest politely and never to say “I can’t” but rather to say “I need help”. 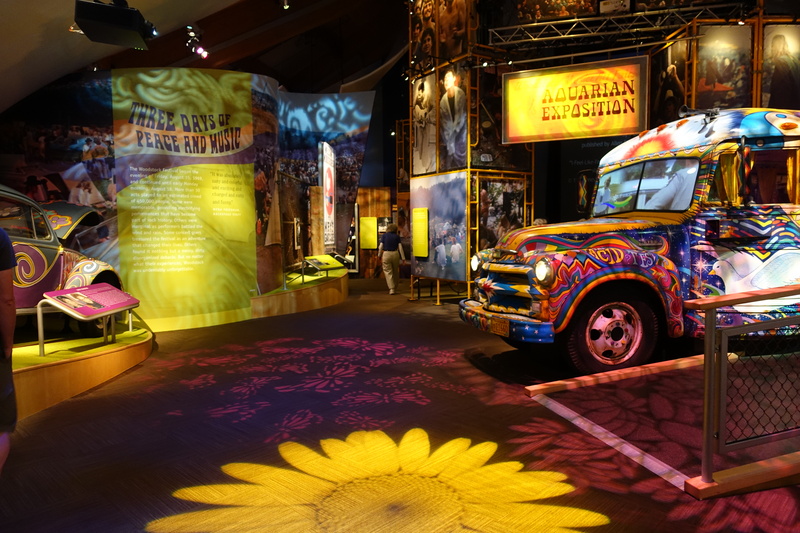 He pointed out scenery and told us that very close to the resort lay the site of the original 1969 Woodstock festival, now home to a monument and museum. Bethel Woods Centre for the Arts’ Woodstock museum. We lost no time in going and learned amazing details about the organisation of the festival itself, how it came at a pivotal moment in the decade of upheaval that was the 1960s, and about the performers and their performances there. Richie Havens’ iconic Freedom was improvised on the spot while he was trying to keep the impatient crowd happy as the opening of the festival was delayed. Hendrix’s spine-chilling rendition of Star-Spangled Banner was full of sonic improvisations reflecting the sounds of the Vietnam War using feedback from the instruments. We walked to the site itself, setting off down the deserted street picturing what it was like when half a million pilgrims did the same nearly 50 years ago, abandoning the impossible gridlock to complete their journeys on foot. 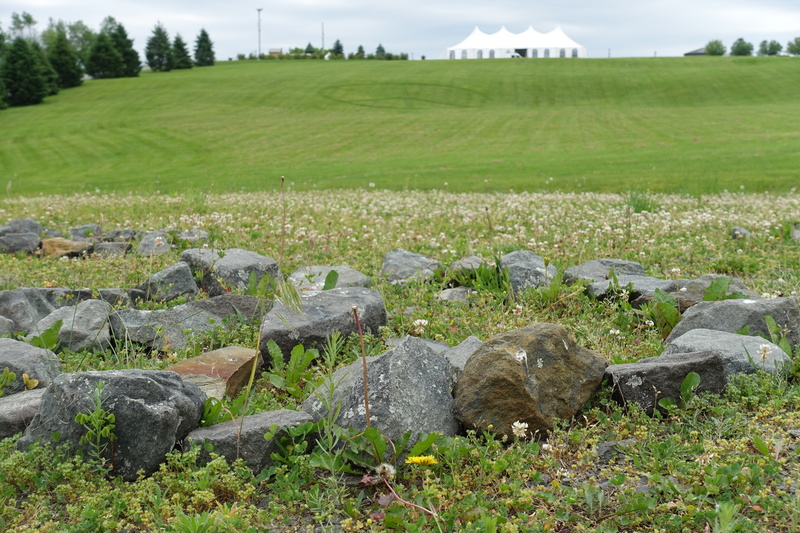 Taken from the stage area – a peace sign mowed into the grass in the background, mirrored by the peace signs pilgrims have made from rocks in the foreground. There is now a a peace sign mowed into the lawn overlooking the slight rise upon which was built the stage where Baez, Joplin, Hendrix and Santana made history. We sat on the stage, feeling squashed by the bigness of it all, and ate our sandwiches (also squashed). We then walked to the lake in which all the Woodstockers skinny-dipped and washed mud off themselves and their clothes. We looked at its quiet expanse and understood something of why one of the festival attendees said, in the museum’s videos, that bathing here, surrounded by so much love and joy, had felt like a kind of rebirth. Filippini’s Pond, where the concertgoers bathed. Walking back up, we greeted the very same guy, Duke, recognising his impressive beard from the video. He had gone to the festival as a young man then got odd jobs in the area afterwards. He just never left. Eventually he served as site interpreter for the museum before retiring.He now still hung around there because, he said, the site held such a strong pull for him. 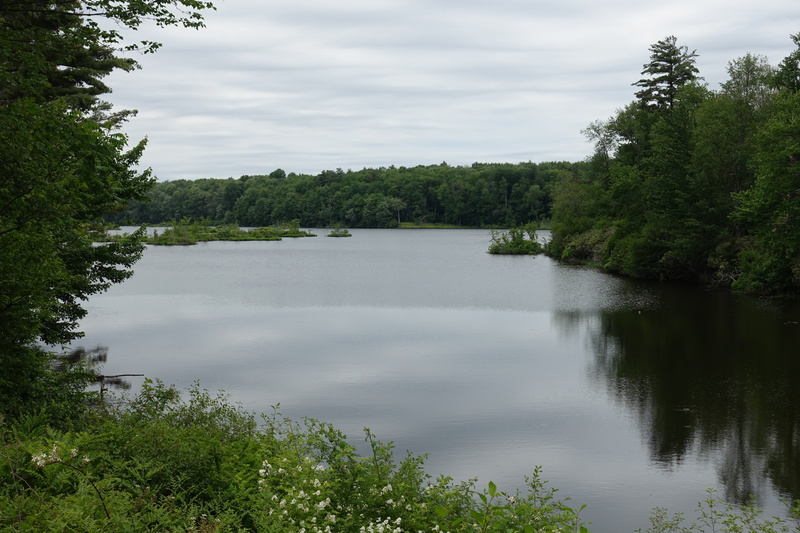 Along with an hour’s horse-riding in the Callicoon forest I treated myself to and a hike we went on with awe-inspiring views, Woodstock was the week’s highlight. The four hours or so we spent poring over it all were a counterpoint to the generally entertaining but sometimes disturbing business of observing rich old people whose lives were generally dedicated to golf and making loud phone calls. We were going to Woodstock. They were going to the casino. Tipping is something I will never fully appreciate. WiFi does not always = Netflix. Stoopid red circle. Citibank US and Citibank AU are completely separate entities with separate databases and contact info. Totally different banks, people. Beer on tap is more expensive than bottled beer –> hello Budweiser my new friend. “Hello, my name is Inigo Montoya. You killed my father. Prepare to die!” is prolly not the best choice of shirt to travel in. Keep right applies to foot traffic as well. Backwards! Once again Wifi does not = Netflix… unless you stay up til midnight and are the only person in the entire hotel using the free 1.5Mbps connection speed. (4Mbps was $20US for the week and I was not prepared to pay for the upgrade). Despite multiple attempts at different combinations of speed, inflection and accent, I have yet to successfully order a Budweiser without repeating myself 3 times. Break in any new clothes/shoes prior to travelling. 1 in 5 bean salads are not too bad. Don’t watch a youtube clip of a comedian to see if they are funny before you go see them live, you’ll end up ruining more than half their act for yourself. Saw me some deer and a groundhog. Americans will tell you anything and everything about themselves without prompting. I now see the true value of diet and exercise… or at least where we are headed without it. 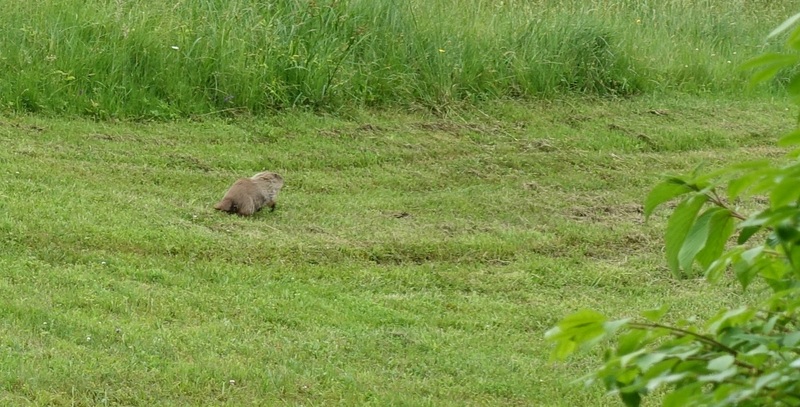 Groundhog makes a break for it. Em: All the Light we Cannot See, Anthony Doerr, 2014 Pulitzer winner; 1992 classic The Artist’s Way, Julia Cameron; Pet Sematary, Stephen King; New York literary memoir My Salinger Year, by Joanna Rakoff. Stu: the first draft of Em’s novel (74% through!) and The Red Queen, Isobelle Carmody. Music: Grateful Dead, Janis Joplin, Led Zeppelin. Original crowd control map made by hopelessly outnumbered police. Briefs, touchingly, read: “this is not a law enforcement operation; this is a peace keeping operation”. Plenty of chaos detailed in the “organisation” of Woodstock, which seemed to be held together by love and enthusiasm alone. Original tickets – though the organisers never ended up collecting them, as the fences broke down and people simply walked in. It took the principal organiser and investor ten years after Woodstock to even make his money back. A hard life at the Villa Roma – reading ‘Walden’, somewhat ironically. This whole county is known as the Bible Belt, and towns like Jeffersonville are a good example; we found multiple churches despite it being essentially a one-street town. But what a street! If you don’t let yourself get charmed instead of creeped out by all the flags, you can really get into the Pleasantville spirit. Villa Roma: weird, but pretty. This entry was posted in (Vaguely) Literary Travels by Emma Young. Bookmark the permalink. My god, you guys. EVERYTHING IS SO PICTURESQUE. Obnoxious shouty capitals required, much like shouty casino going senior citizens. Did you take pictures of the ponies? PONIES! When all else fails, rely on your approximation of an American accent. Do not reveal you are actually a foreigner. Unless you are in Brooklyn, or LA, where they all love Australian flat whites and aussie avocado toast. When you want something else, Mike’s hard lemonade really is like drinking lemonade, but alcoholic. Sorry Juj, no ponies, because I didn’t make Stu come riding, I didn’t have anyone to take them! But there WILL be a next time. I promise. Thanks for the beer recommendation we will certainly take it! And have noticed Mike’s but not been game to try it. Will report back. Canadian beer Molson is pretty good. Thanks, I only just got this. Em you have a way with words that make them come alive. Perhaps you could use that magic on the Wifi for Stu. Love your comments Stu. Mightily enjoying the trip so far……..ya gotta love it when a pro blogs…..brings everything so vividly to life.